How to get paid for your passion for writing - $29.95 U.S.
Have you ever written short stories, but have had a difficult time getting them published, let alone anyone to actually read them? Or, do you find writing incredibly relaxing and could write for hours on end? Wouldn’t it be great to get recognition for your writing? Wouldn’t it be better still to get paid for your writing? If you’ve ever wondered whether you could make a career from writing, then you don’t need to worry any more. This guide has been developed using an easy to follow, systematic approach that has generated individuals thousands of dollars when implemented. Learn where the writing opportunities are, and learn how to secure them immediately. 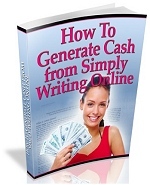 You would be surprised how many online companies are begging for good quality writers. Over the last 10 years, a lot of writing opportunities have shifted to the internet. The funny thing is, writers focus on their passion for writing, so many times don’t know where to look. Learn how to get paid more for each writing gig, and more often. Using this systematic approach, I actually went from getting paid $5 for an article, to $200 for 10 page essays, to over $300 for a short and concise business report. Learn how you can increase your productivity immediately. There are software tools to speed up your writing, other resources to do any research you need to, plus much more. Usually writers don’t know where these goldmines are, simply because they are too busy writing! Plus, much more! This report is full of screenshots, step by step details that shows you clearly what you need to do, to get paid now. I’m actually pretty impressed with this guide. I wasn’t sure exactly what to do before, and I had tried a writing a little bit before. However, after skipping around a bit, I finally sat down, followed it, and saw some serious results. Thanks!